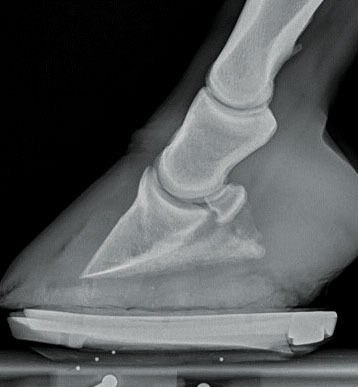 Hoof Radiograph showing coffin bone rotation. Laminitis is a common condition of the equine hoof that can vary in severity from mild intermittent lameness to severe pain and an inability to stand, resulting in a guarded prognosis. 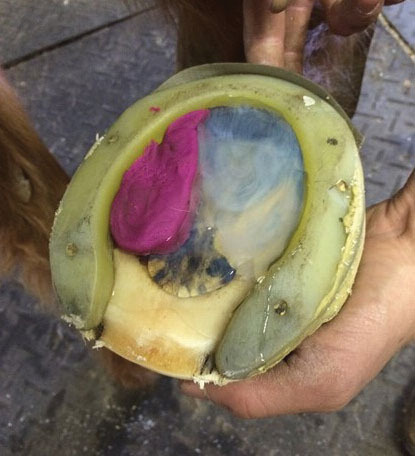 The disease is caused by inflammation of the laminae of the hoof, which attaches the tough outer hoof wall to the sensitive inner structures of the hoof and holds the coffin bone in place within the hoof capsule. In severe cases, the laminae inflames to the point of failure and can no longer support the coffin bone. The coffin bone will then rotate (tip forward) inside the hoof capsule and cause permanent damage. 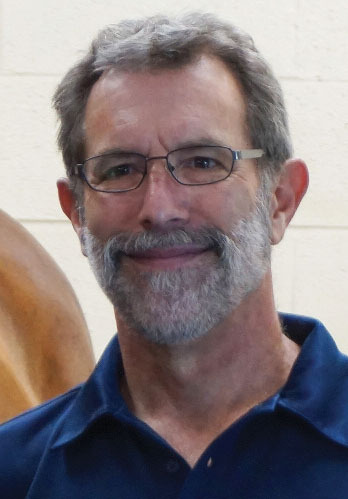 Over the past decade, veterinary medicine, diagnostic imaging and farrier science have made great strides in understanding and treating this condition, which has greatly increased a horse’s chance to lead a comfortable life following this diagnosis. Therapeutic glue-on shoe to improve mechanics. 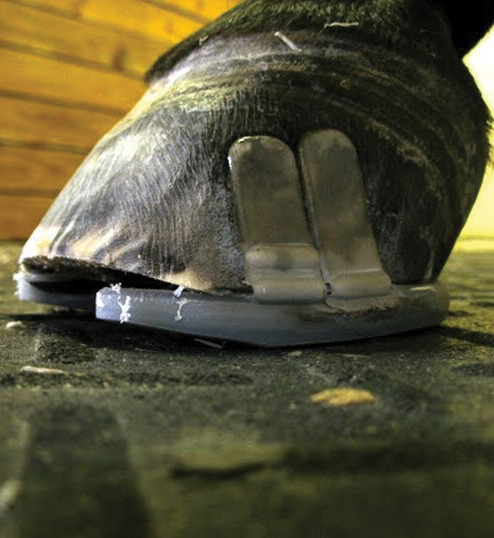 Farriers now have a multitude of new shoeing technologies, which can support the hoof and ease pain, allowing damaged structures to heal, leading to positive outcomes not typically seen a decade ago. It is now possible to glue specialized shoes in place, creating a more comfortable application and thereby improving mechanics. Beyond new shoe technologies, farriers have an arsenal of varying density sole supports. Finding the right combination of shoe, break-over, and sole support can make horses with laminitis dramatically more comfortable and allow them to heal. Collaboration and new imaging techniques and technologies help farriers to understand how to position shoes correctly and treat challenging laminitis cases. Key to a successful outcome is a care team, which should include your primary care veterinarian, your farrier, barn manager and trainer. Each team member relies on the other for information to make necessary and timely changes to help these horses. 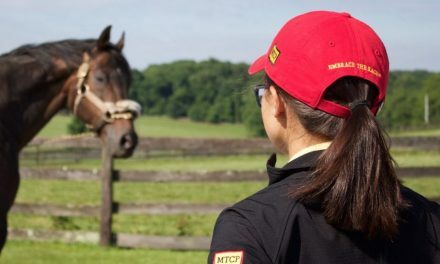 You’re Invited: Sign up (name and email address to emcinfo@vt.edu) for EMC’s free equine health alerts and notice of Tuesday Talks, a free, educational seminar series on topics of interest to the horse community. 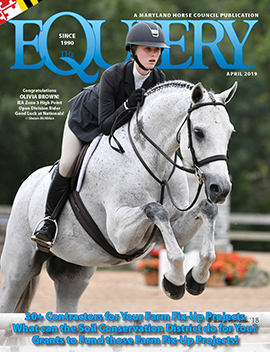 Like us on Facebook to stay informed about the lates.t advances in equine medicine and health. NextCapital Challenge is in Full Swing!